HomeOther NewsHappy 10th Anniversary, Bobby Gruenewald and YouVersion! July 10, 2018 Deborah Walker Other News Comments Off on Happy 10th Anniversary, Bobby Gruenewald and YouVersion! For more than 135 years, that objective has been at the heart of the education and preparation that Nyack College and Alliance Theological Seminary offers its students. Because of the College and Seminary’s commitment to spreading the gospel, President Michael G. Scales is excited to join millions around the globe today who are celebrating #bibleapp10, the 10th anniversary of the YouVersion Bible. 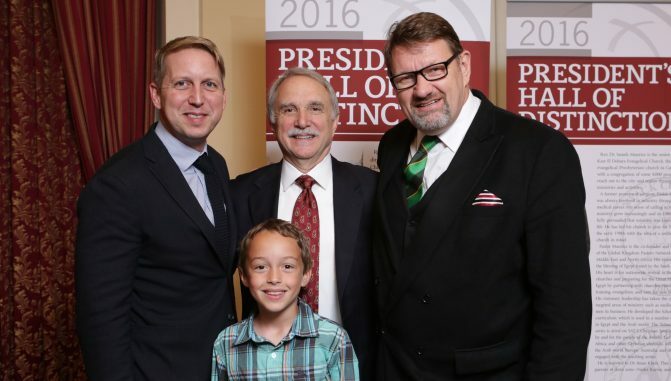 Life.Church pastor, Innovation Leader and YouVersion founder Bobby Gruenewald (pictured with his son, Robbie; Dr. Scales and 2016 President’s Hall of Distinction recipient, Dr. Robert Glover) says “We’re excited about the new ways God is using technology to help people make even more connections between the Bible and their daily lives.” Learn about the YouVersion story.